One of our favourite actors to play the role of Frank N Furter, David Bedella, is in concert for one night only on Monday 2nd March 2009. The concert will also benefit the Terrence Higgins Trust. There are two shows one at 8pm and a late night show at 11.30pm at London's Leicester Square Theatre. In addition the event with be hosted by the lovely Christopher Biggins (original RHPS cast member and stage show Narrator). 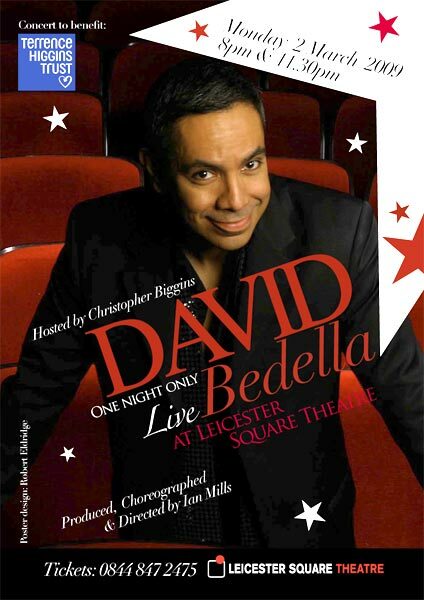 Award Winning Actor, David Bedella organises Benefit Concert for the Terrence Higgins Trust in just Three weeks! David Bedella is an award winning Broadway and West-end star, who won the 2004 Best Actor Olivier for his role in Jerry Springer the Opera. He was invited to reprise the role at Carnegie Hall in January 2008; followed by an appearance at the Royal Albert Hall in Chess in Concert, co-starring with Josh Groban and Idina Menzel. He is well known in the UK for the role of Dr Carlos Fashola in the BBC TV drama Holby City and for his portrayal of Frank-N-Furter in THE ROCKY HORROR SHOW. This concert celebrates his 28th year in Show Business and is a HIV/Aids benefit concert for the Terrence Higgins Trust. Following the concert, on March 22nd 2009 he leaves to make his Sydney Opera House debut. The concert will be hosted by Christopher Biggins and will showcase songs from David’s debut album - The Dean St. Sessions. It promises to be an exciting evening of superb music and dance featuring David Bedella, supported by some of the UK’s top theatre musicians, singers and dancers who have all donated their time free of charge and a twelve piece Orchestra interpreting some of the greatest hits from Sammy Davis Jr & Liza Minnelli to George Michael & Donna Summer. His Debut Album – The Dean St. Sessions (Curtain Records) will be launched on the night of the concert. David Bedella is delighted to be donating £2.00 of every ticket sold and any proceeds from the concert (above cost) to the Terrence Higgins Trust.